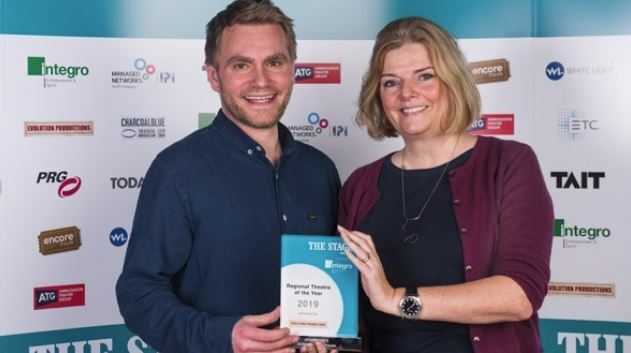 Huge congratulations to Nottingham Playhouse who have won The Stage Award for Regional Theatre of the Year. It’s a huge honour to be recognised for their commitment to producing great quality theatre for and about our community and they would like to thank everybody who has supported them over the past year. The last 12 months has seen Nottingham Playhouse re-energised. Under the leadership of Chief Executive Stephanie Sirr and new Artistic Director Adam Penford, the theatre has not only enjoyed an increase in ticket sales and an audience growth of 10.5%, it has been revitalised creatively. Penford’s first full season included a revival of Beth Steel’s mining drama Wonderland, Matthew Xia’s production of Mufaro Makubika’s Alfred Fagon award-winning play Shebeen, about the city’s race riots; Holes, the first in-house family show on the Playhouse’s main stage in years, and a slick production of 1960s musical Sweet Charity, featuring a dazzling performance by Rebecca Trehearn. Most recently, Penford directed a revival of Alan Bennett’s The Madness of George III, starring a superb Mark Gatiss in the title role, which was broadcast by National Theatre Live. Local company Fifth Word staged James Fritz’s Lava, a timely new play about grief, in the Neville Studio. Xia was recently appointed an associate artist along with playwrights James Graham and Amanda Whittington. Part of the Ramps on the Moon consortium and a partner on the Open Door initiative, Nottingham Playhouse has displayed a commitment to work that engages with and reflects the region’s communities while making the theatre a destination venue, putting it firmly back on the map.